At the heart of the wine industry is the pretty town of Stellenbosch, the second oldest town in South Africa and regarded as the wine capital of the country with over 110 cellars in the area. 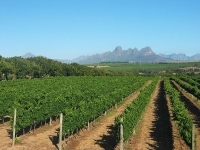 The Stellenbosch vineyards were established by the Dutch governor of the Cape, Simon van der Stel, who arrived in 1679 and noted that the combination of rich soil and ideal climate were perfect for viticulture. In 1971 the first wine route in South Africa was opened, and today the Stellenbosch wine route is perhaps the best known and finest that the country has to offer, producing award-winning wines from estates such as Morgenhof, Kanonkop, Warwick, and Zewenwacht. Spier Estate is renowned as a unique cultural resort that is famous for its Summer Arts Festival, and boasts the oldest working wine cellar in the country. Stellenbosch is also steeped in South African history and Afrikaans culture and was settled by the Dutch East India Company to produce food for passing ships. Old oak trees line the streets where Cape Dutch architecture, museums, and national art collections are a reminder of the town's heritage. The town also boasts the world's only Afrikaans university, a premier educational institute, which has produced many great sporting heroes, including many Springbok rugby players.